I promised John, a coworker of mine, I would make him a pumpkin roll for Thanksgiving. Well, 6 months and 21 days later I’m finally fulfilling my promise of a pumpkin roll! Better late than never!!! To be honest, I was quite intimidated when John requested I make this cake back in November. I had heard that pumpkin rolls were hard to make, and I was nervous that the cake would crack as I was rolling it, or that it would not stay together. 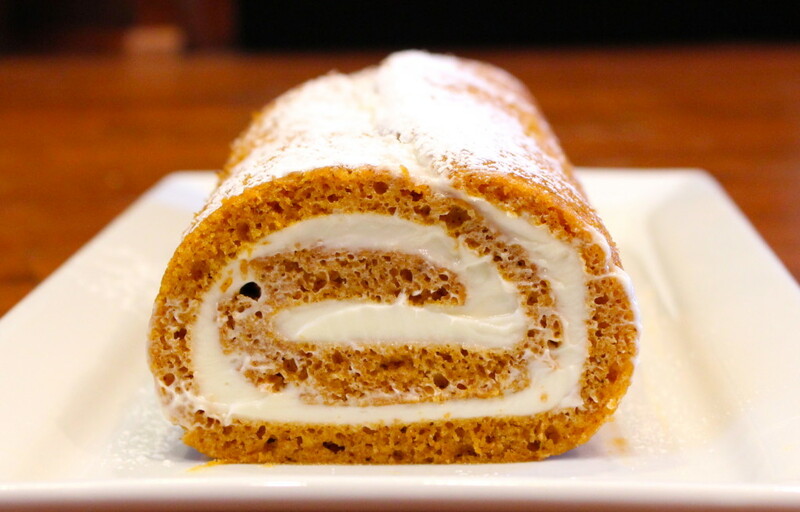 DO NOT BE AFRAID… Pumpkin rolls are easier than you think, so don’t be intimidated!!! Mixing the cake batter takes only minutes, and baking the cake takes less than 15 minutes. Plus, unlike a layer cake, there is no slicing cake layers, filling, frosting or decorating. 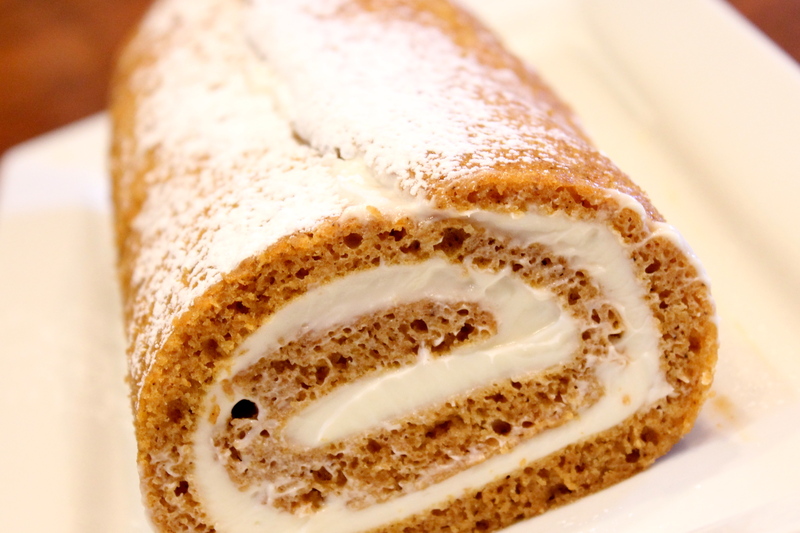 Simply lather the cake with cream cheese filling, roll it up, dust with powdered sugar and you’re done! 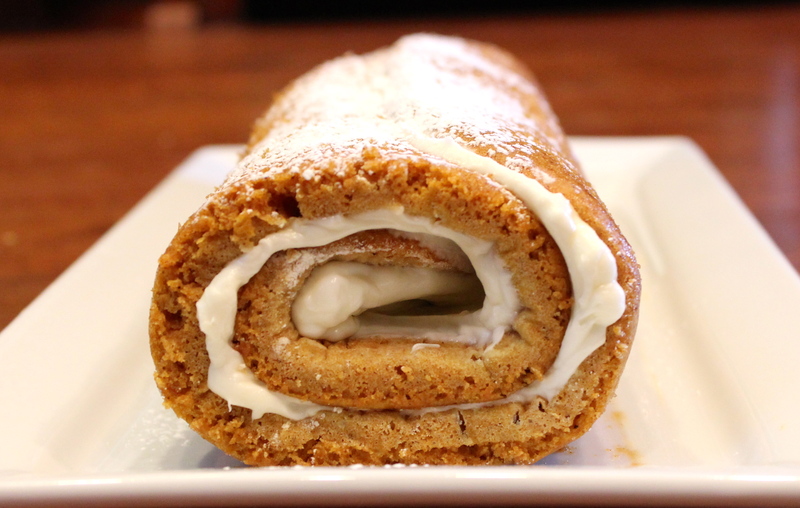 A big thanks goes out to to the Brown-Eyed Baker, who posted a great pumpkin roll recipe with excellent instructions and ingredients for this no-fail, traditional Thanksgiving dessert. Bake cake for 12-15 minutes. 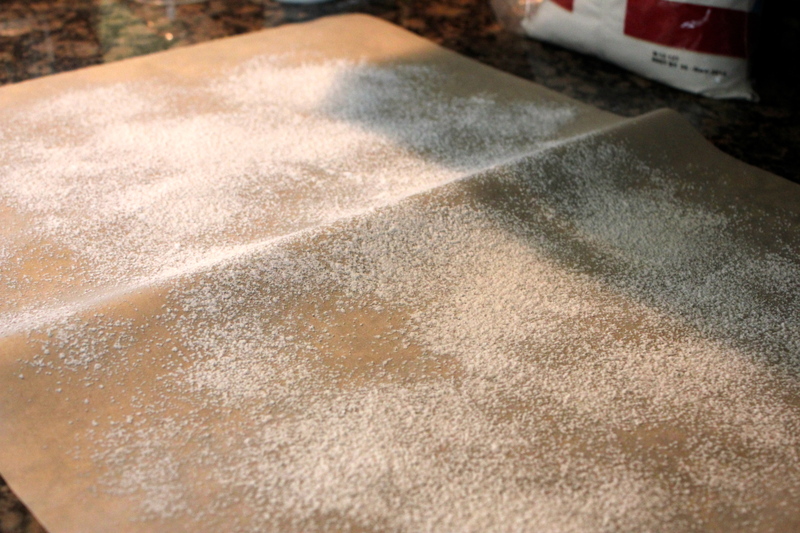 While cake is baking, sprinkle powdered sugar on a piece of parchment paper. 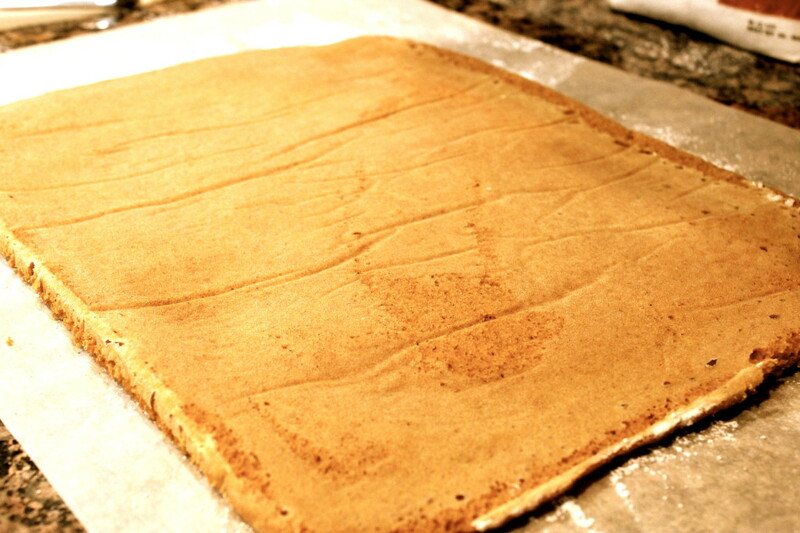 Flip cake out onto powdered sugar-lined parchment paper. Carefully peel back parchment paper from top of cake. 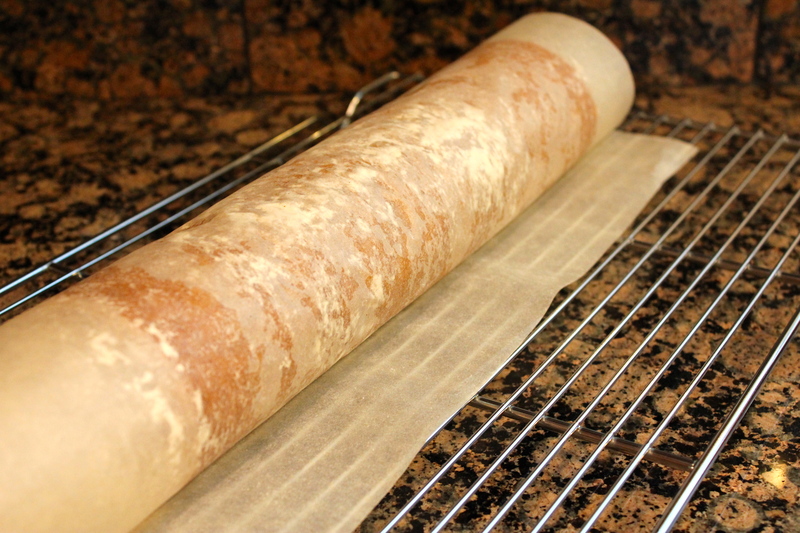 Roll the cake into a cylinder using the parchment paper to help you. Let cake cool to room temperature on a wire rack. Carefully unroll the cake. 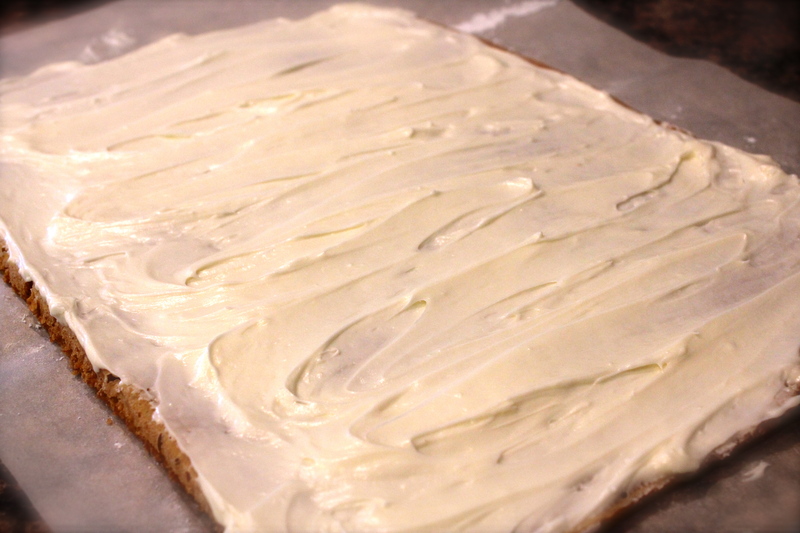 Spread the cream cheese filling evenly over the surface of the cake, then re-roll the cake. Tidy/pretty-up the end of the cake by trimming off the ends. 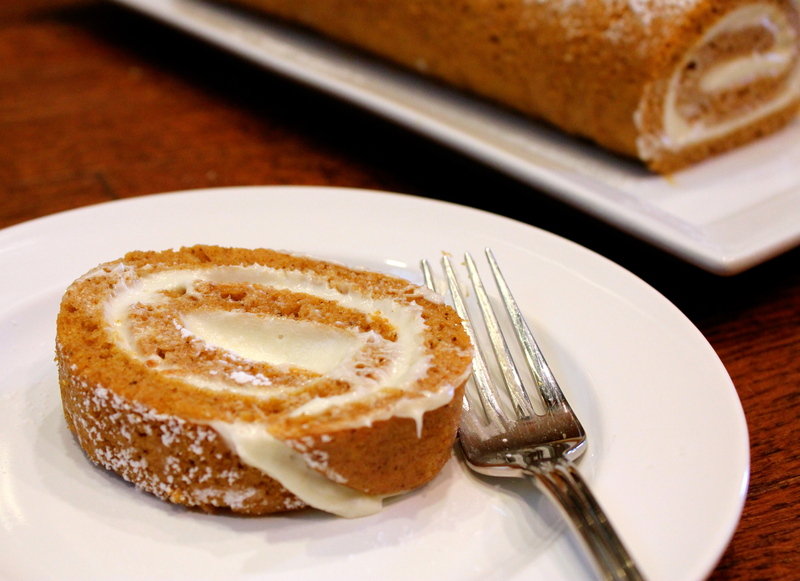 Don’t forget to dust the pumpkin roll with powdered sugar! Cut a nice-sized slice and enjoy! A lady his mom used to work with would take requests every holiday season for pumpkin rolls. The lady would charge her coworkers $12 for each roll, which seems like a pretty good deal to me. One year the lady had over 500 orders from her friends and coworkers. John’s mom would buy one every year and thus you can see how his love for pumpkin rolls developed! MAKE THE CAKE: Preheat oven to 375 degrees F. Grease a 15x10-inch jelly roll pan. Line the pan with parchment paper, then grease and flour the parchment. Set aside. In a small bowl, whisk together the flour, baking powder, baking soda, cinnamon, cloves and salt; set aside. With an electric mixer on medium speed, beat the sugar and eggs together until combined and thick, about 2 minutes. Add the pumpkin and mix to combine. Add the dry ingredients and use a rubber spatula to fold and mix until no flour is remaining. Pour the batter into the prepared pan and smooth into an even layer. Bake for 12 to 14 minutes, or until the top of the cake springs back when lightly pressed. While the cake is in the oven, place a piece of parchment paper on the counter and sprinkle liberally with powdered sugar. When the cake comes out of the oven, immediately run a knife around the sides of the pan to loosen the cake. Turn the cake out onto the prepared piece of parchment paper. Carefully peel off the parchment paper from the top of the cake and discard. 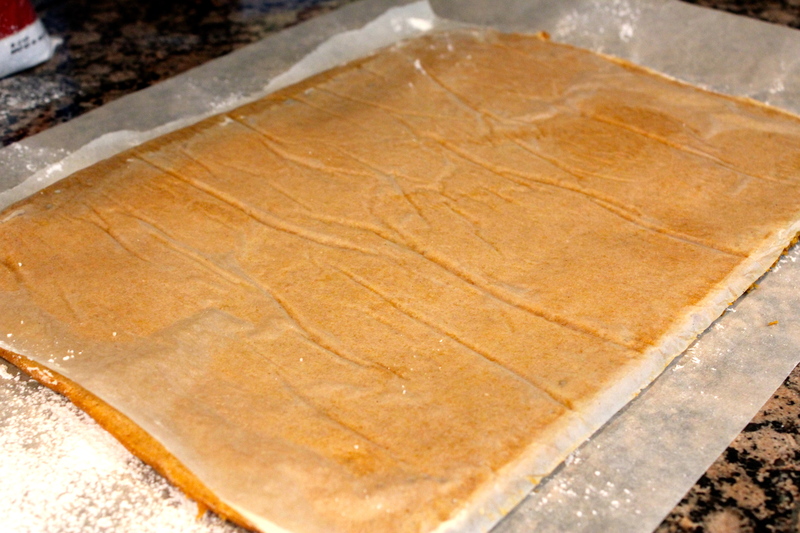 Starting with a short end, carefully roll up the cake with the parchment paper. Place the rolled cake on a wire rack seam-side down and allow to cool to room temperature. MAKE THE FILLING: Using an electric mixer on medium speed, beat together the cream cheese and butter until smooth and creamy. Add the powdered sugar and beat until completely smooth and light. Add the vanilla extract and mix briefly to combine. Carefully unroll the cake. Spread the cream cheese filling evenly over the surface of the cake. 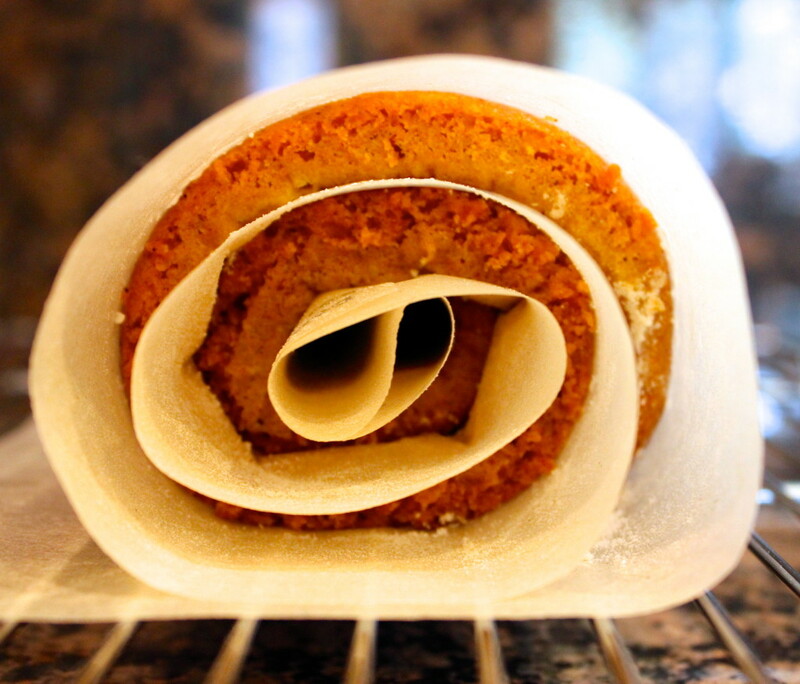 Re-roll the cake, then wrap tightly in plastic wrap and refrigerate for at least 1 hour. 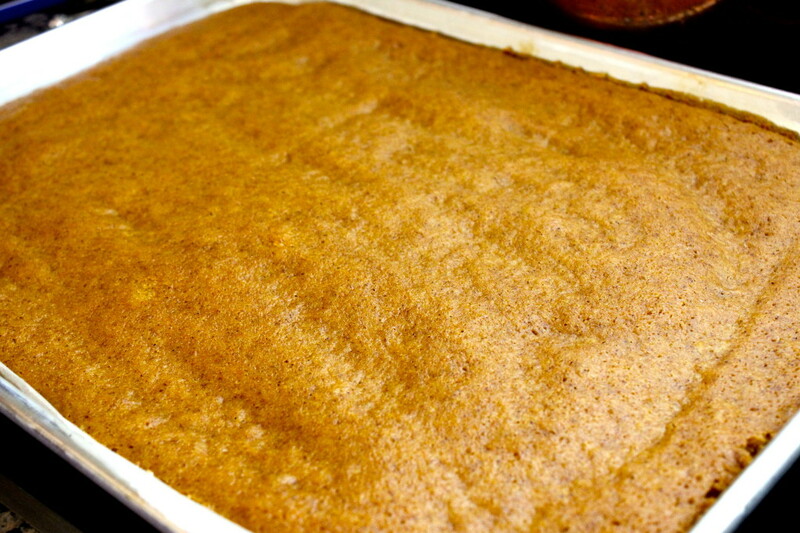 When ready to serve, place the pumpkin roll on a serving platter and dust with powdered sugar. Leftovers should be wrapped in plastic wrap or placed in an airtight container and refrigerated. 3 Responses to "Pumpkin Roll"
Pumpkin rolls are great with pecans in the batter or on the icing also!! Pecans would be a delicious addition!